A workshop review – Marie Delaney: Dyslexia – a problem or a gift? Despite having given my own workshop on dyslexia I was keen to here what others had to say on the subject as I am far from an expert on the subject, in fact the more I study dyslexia and other learning difficulties (for want of a better “label”), the more I wonder how it could ever be possible to declare oneself an expert on such a complex question. Marie however obviously has an immense amount of experience in working with people with SEN. Recently on twitter I got my wrist slapped for referring to someone as “dyslexic” and I am well aware, as Marie pointed out, of the danger of labelling people. Every student has different needs and abilities, however it is very difficult to write a review on a workshop of this kind without lapsing into some “stereotypical” labels, if only to save space, so please excuse me. 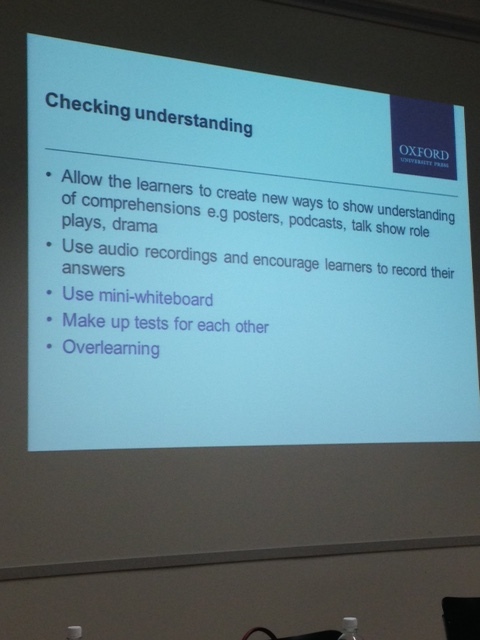 Marie referred to learning differences as opposed to learning difficulties, and encouraged teachers to get to know their students needs and abilities, to ask the student to tell you how they learn and what difficulties they encounter, rather than jumping to conclusions. She also emphasized the importance of teachers trusting their intuition more in these cases, and she said something that I have found to be the case often in my classes – that in fact the strategies that help SEN students which actually be off benefit to all the students in the class. Marie talked about the gift of dyslexia : citing a tendency towards holistic, “out of the box” thinking. I must also mention that I got slapped on the wrist for saying a similar thing in my workshop notes, critics pointed out, quite rightly, that this was also labeling, and that not all dyslexic students were creative and holistic, and calling them such just made those that weren’t feel even worse, in a “you have reading/writing difficulties and you’re not even a creative start-up entrepreneur or scientist” way. I found questions such as “what happens in your head when…” “how did you learn/understand …” very interesting, , I wonder what my students will answer, because I’m not sure how I could explain what happens in my own head. Marie pointed out that although we complain that our students are not focused, it is in fact normal for our minds to wander and that we are always focused on something, just perhaps not the lesson in question, and that it is more useful to ask students how they can bring their attention back to the task at hand rather than berate them. Marie used a mind map to remind us that certain students prefer to see the whole picture first, rather than learn in a linear way, we tend to teach in the same manner as we were taught ourselves and must be aware of different styles that may be more adapted to our students. 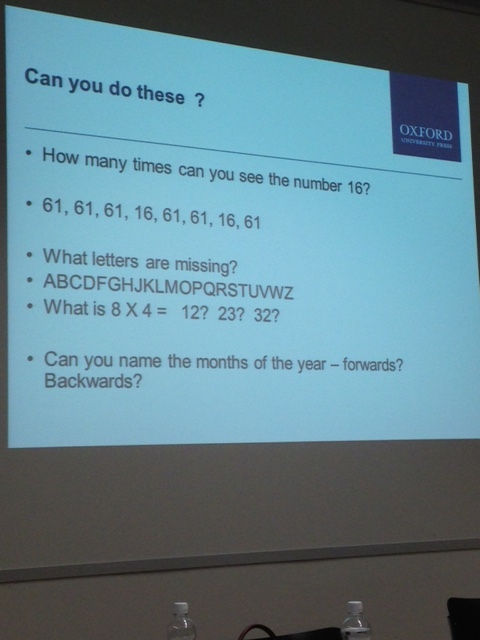 The following slide gave us an idea of some of the difficulties that learners can face, as participants we didn’t actually find all the activities simple, when finding the missing letters I didn’t spot them all, nor did my neighbor, but interestingly, she hadn’t missed the same ones as me, proof if needed that indeed, no two people see things the same way. Not all students who are staring out of the window are daydreaming, and even if they are it maybe with some topic related to the lesson, and they may in fact be learning through visualization. Being called “lazy” won’t help any student, whatever their learning differences, and should be avoided at all costs (tempting as it sometimes is for the teacher!). Despite the differences, Marie did give a general definition of dyslexia as well as some common indicators which was useful as it can be easy to forget that difficulties in organization or timekeeping for example may be related to dyslexia, and that although we may take into account reading and writing difficulties we should also be a little more understanding with peripheral aspects of dyslexia. I entirely agree with Marie when she talked about the main problem being one of self-esteem and she showed us a very powerful technique to develop confidence: Complete the following phrases- When I feel good and confident that’s like… And that feels like… Draw a representation of these answers and keep them at hand, to be looked at before tests or when you feel nervous etc. All of this was really interesting even though a lot of it reiterated what I had read before, however it left little time for the practical activities that Marie suggested, such as: A great activity that I’ll definitely be using was using a length of string as a visual timeline and asking students to represent phrases or verbs and stand in their “correct” place along the line. On the whole this was a great workshop, maybe too much theory and not enough practical ideas for some participants- although not myself I must say, time flew by and I wish Marie could have talked longer on a subject that she obviously knows a lot about, and is passionate about. This entry was posted in Uncategorized and tagged dyslexia, dyslexia in efl, EFL. Bookmark the permalink.